After 13 years in increasing despair at never getting to the top of my London borough’s apparently endless allotment waiting list, I applied to another London borough a few weeks ago and immediately – starting last Saturday – got a half-size allotment of five poles. Half-size! That’s deceptive. My new smallholding is huge, at least the size of my house, surrounded by other plots of either twice or four times the size, and charming brambles and wildflowers and fruit trees in blossom in between (it is not quite in the perfect condition of the plot in the picture, by the way; I just borrowed that picture). Call me over-enthusiastic, but at the end of my first weekend, even if I ache a lot, my plot still seems an absolute paradise of fruit and veg and flowers and bees and fascinating sheds and delightfully Chekhovian characters and tea and bric-a-brac and happiness. Which has all, naturally enough, made me wonder how it came about historically that a bunch of middle-class London characters such as my fellow allotment-farmers and me have been so blessed. Who gave the citizens of England the right to five or ten poles of land somewhere near where they live, for not much in the way of rent, and when, and why? Is it all just to give us a chance to out-Fearnley-Whittingstall Hugh and live poshly off the finest of fresh food without paying the supermarkets for it? Is it part of living in a democracy? Or is it something to do with being afraid of hunger - digging for victory in the Second World War - or an older right still, corresponding to older hungers? Was it once a way for the poor to feed themselves and ward off starvation, like the Russian dacha-and-allotment system that (sometimes) kept the Slavic version of the grim reaper away at tight times in the 20th century? The answer, it seems, is that there are at least two allotment histories merged into one outcome, and all these sets of suppositions are true. On the one hand, there was a long-running and serious story about alleviating poverty. The enclosures movement that saw peasants squeezed off common land as it was hedged and allocated to a single owner, making it unavailable for traditional shared farming, caused unrest through history and in particular sent crowds of the hungry poor into towns to kick-start the Industrial Revolution in the 18th century. But the fightback on behalf of the dispossessed also eventually made it mandatory to make growing land available to the poor and displaced. Secondly, in a fairly separate strand of history, the middle classes prospering in towns as a result of the Industrial Revolution then clamoured for “city allotments” to do a bit of digging, but also to have a garden to relax and escape the confines of the city – partly because of a 19th-century obsession with gardening and partly as a show of wealth. These “posh” plots became known as “pleasure gardens” and often had brick summerhouses or follies. Families might even stay the night in their city allotments, which were surrounded by hedges or fences – but the plots didn’t survive the spread of Victorian villas with their own gardens later in the 19th century. Most were turned into “normal” allotments, or built on. So it’s the other, more brutal story – the one of brutal eviction of peasants from the land – that really brought us the Paradise Regained of modern allotments, I’d say. A 19th-century question: how little land does a peasant need to stop revolting? The enclosure movement in the late 18th century helped shape modern Britain. Enormous swathes of the English countryside were enclosed and the new fences planted altered the look of the landscape for good. By the mid-19th century, most common land in Britain had been enclosed and a whole class of rural people dispossessed. 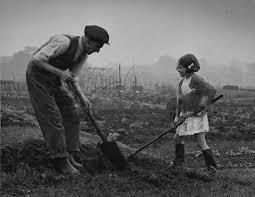 Throughout this period, according to The Allotment Gardener, movements came into being to try and fight for some ground for the common labourer who was quietly losing his all. 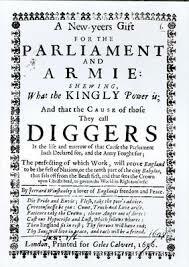 As early as 1649 protesters calling themselves the “Diggers” demanded the “right to dig”. 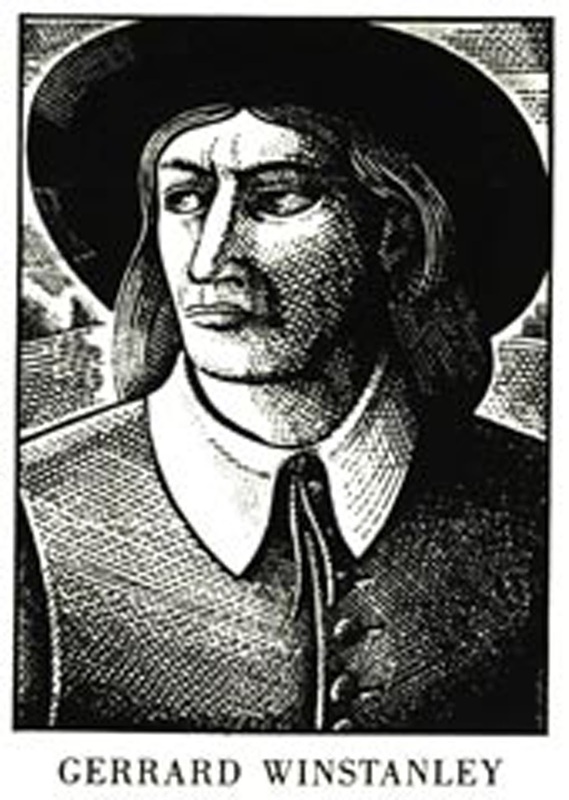 A group of hungry men led by Gerrard Winstanley, they organised a mass trespass on waste land in St George’s Hill, Surrey, sowing it with vegetables and wheat. Winstanley was a cloth merchant whose business had been ruined in the Civil War; he had, in January of 1649, published The New Law of Righteousness in which he envisioned a just and harmonious society guided by spiritual regeneration through Christ. He explained his belief that the miseries of the world result from men turning from God, whom he equates with Reason, to satisfy greed and the pursuit of power. Poverty and inequality stem from the selfish buying and selling of land and property, and could be eradicated by communal living and an acceptance of the risen Christ, he wrote: "Was the Earth made to preserve a few covetous, proud men to live at ease, and for them to bag and barn up the treasures of the Earth from others, that these may beg or starve in a fruitful land; or was it made to preserve all her children?" 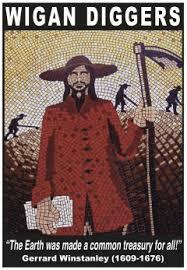 The New Law of Righteousness was published as the trial of King Charles I was drawing to a close. Four days later, the King was beheaded at Whitehall. England was declared a "Commonwealth and free state". In this revolutionary atmosphere, it seemed possible that all tyranny and oppression could finally be brought down and Winstanley's utopian vision become reality. In April, to prove their point, Winstanley's Diggers started planting St George's Hill. Their idealism, it turned out, was misplaced. The new authorities didn't like it. A Kingston court indicted and fined them in July. By August, harassed off the land, they moved on. But the idea of a “right to dig” had taken hold. The social unrest caused by the process of enclosure led to a number of private initiatives to provide the common man with land to grow and provide for himself. This was mainly driven by private land owners who commonly believed that not only would a small patch of land be worth more to their workers than an increase in salary, but that it also kept them away from the ale house, making them better workers. These sponsors didn’t want workers turning up too tired to work at their paid employment, however, so they wanted the size of the allotments provided to be restricted. The age of legislating for social improvement was at hand. The General Enclosure Act in 1845 offered “field gardens” of up to a quarter-acre for the poor, but the Act was poorly framed and made little real difference. After an election in 1884 in which allotments were a political hot potato, in 1887 an Allotments Act was introduced, which made it possible for local authorities to acquire land for allotments and also made it compulsory for local authorities to provide allotments where there was demand for them. Local authorities resisted however, and this led to further Acts in 1894, and then finally the Smallholding and Allotments Act of 1907. This was the defining measure, still in place today, which forced councils to provide allotments where there was demand. Under it a local authority is obliged to provide allotments if there is demand from more than six people (unless, as with central London, there is insufficient space). Until now handing over land had seemed, to many in the governing classes, a where-will-it-all-end pandering to the demands of the greedy poor. World War One changed that. With the German blockade biting and people worried about where their food would come from, the authorities stopped going slow and hastily tripled the number of plots available, which rose from half a million to one-and-a-half million by 1917 (this fell back below a million by 1929). Enthusiasm hit another peak during the Second World War. All sorts of land was given out to allotment plots – even parkland and city gardens. My father remembers the central garden of the square where he and I both grew up – St Peter’s Square in Hammersmith, west London - being turned over to vegetables during the War when he was a small boy. The picture on the left is of Hampstead Heath. 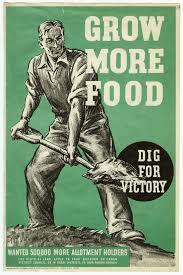 It was the age of the Dig for Victory campaign, with the government exhorting gardeners to grow, grow, grow and get the family along to help too. The numbers of allotment holders shrank dramatically after the war ended. An era of ready-made food and Wonderbras, and the uncoolness of the flat-capped-old-man-gardener image, looked set to kill off forever the idea of it being fun growing your own veg. Yet every decade or so another TV programme would come along that would briefly send people rushing for an allotment again – “The Good Life,” in the Seventies, and then in our time almost anything by Hugh Fearnley-Whittingstall. Think organic. Think the rise of green parties everywhere. It’s all reflected down at the allotments too. There are about 300,000 potholders in the UK today, and, according to the National Society for Allotment and Leisure Gardeners, there are another 100,000 on waiting lists. (No, make that 99,999 – this week I’m crossing myself off the waiting list I’ve been on for so long). The average age has shifted down several generations. I’m at the old end of my field, it seems. Many of the people I met were in their 30s and 40s: mums with children, young men with girlfriends ... like fresh-faced Katie and many others on YouTube. My allotment field is a place of kindly advice and shared cups of tea, and cheerful internationalism too. Savvy immigrants from the gardening nations are all strongly represented here. There’s an Afghan guy growing an astonishing number of crops on his plot, just down from me; and a pair of Cypriot brothers who’ve had side-by-side plots for longer than anyone can remember on the other side of him. Below that, a double plot – 20 poles! Pretty much a farm, with three sheds and a greenhouse and more fruit trees than you can imagine – belongs to Svitlana, from Ukraine, who farms it with her sister and her sister’s small children. She kindly offered me tea and the use of one of her sheds to store my stuff. She keeps a nip of vodka and a couple of tins of sardines in hers, too, in case a party is needed. I used to worry about what I’d do if a world-changing catastrophe hit - Brexit or Grexit or Donald Trump or a terrorist strike. Now I know, and it is strangely reassuring. We have two allotment sites in my village (and plenty of vacant plots !) I used to have one but at 90m squared it was far too large for me to manage with just my teenage son for help. I loved having it though and learnt an enormous amount as at the time I was a horticulture student. It's immensely satisfying when you can get anything to grow (we did very well with potatoes !!) and ours became a wildlife haven. We had a bumble bee nest in the compost heap for two years running. I was sad to give it up due to work pressures but intend to have one again-thanks for posting. Very interesting post! We've had allotments in the past but when circumstances arose that meant we could afford a bigger property, we bought a cottage with a thrd of an acre and we are now selfsufficient most of the year round in the basic fruit and veg. We've just finished last year's onions. Still eating last year's potatoes. We have a freezer that still holds plenty of raspberries, redcurrants, loganberries,blackberries, bramleys for pies, sliced leeks and runner beans from last year. We don't buy lettuce all summer long. I make masses of tomato confit for the winter. The first house we bought as newly weds, we made into a veg garden until our name reached the top of the allotment list and we had allotments (double plots) for many years until we bought our house with land. My husband says though that people have lost the gardening skills of earlier generations and many of them take on allotments with starry notions and not a clue about what they're actually doing. That practical knowledge neeeds to be written down and disseminated while the older generations are still around to pass it on. My Dad had an allotment all his life, and kept it beautifully. His shed was a miracle of neatness, and he grew cutting flowers as well as vegetables. It was a lovely place to sit and contemplate the universe. The first one he had, when I was small, was bordered by a canal, which scared me because it was so deep. One of my earliest memories is helping him to weed. I suppose we would have looked rather like the father and daughter on Hampstead Heath! I'm full of admiration for all of those busy allotment-holders and their crowded and productive plots - especially when I look out at the weeds springing up in my own garden now the sun has come out again. Thank you for this interesting run through "digging" history, Vanora. We passed St George's Hill on our way back from holiday in Kent, last Saturday. So glad to read about the diggers, and the story of dispossession from the land. But now allotments are being stolen, and the soil, the product of years of work, being wasted or sold, maybe, as the land is sold to developers. Time for the diggers again? Incidentally, there are gardens called Schrebergaerten in Germany and Austria on the same principle. However, they are often used as flower gardens for flat dwellers to spend weekends in. The Russians of course go further with dachas. Thanks for this.